Melody and I took a quick day trip to Bainbridge Island last weekend. It was the first time I'd been there, and was a fun getaway. Since it's so close to home, we knew we would end up winging it for a lot of the trip, but we did figure out a rough outline, as well as figure out a few lunch options. Our original plan was to use a two-for-one coupon for the ferry, as well as using a two-for-one coupon for the Bloedel Reserve garden. Since we would be going on the ferry without a car, we looked for transportation around the island. The bus system doesn't run on Sundays (which would be the day we were there), but we found information about the Frog Hopper, a hop-on-hop-off bus that had a couple routes. It seemed that in addition to going north to the garden, we would also be able to go south to the Japanese-American Exclusion Memorial. The night before we left we double-checked our ferry coupon and noticed it said that it wasn't valid for days that the Mariners had a game. Yep, that meant we wouldn't be able to use it. We bought our ferry tickets online and printed them out, because the instructions said they needed that (it wouldn't work to just use a phone). Tickets procured, we then looked into which ferry to take. Because we knew we wanted to do a bunch of stuff around the island, and the Frog Hopper didn't start until around noontime, we figured we could walk on the Waterfront Trail near the ferry terminal in the morning, eat lunch, then catch that bus. Because of the timing, the bus we took to downtown wasn't one we could catch a few blocks from the house. We saw the bus we wanted was going to be close to on time, but by the time we had walked the mile to the stop, it was going to be almost 10 minutes late. Better than 10 minutes early. Once downtown, we got to the ferry terminal a few minutes before boarding was going to start; great timing. When we went to board, we ended up being behind a couple who were trying to walk on even though they had their car in the holding lot. The woman taking tickets explained that the cars were beginning to load at that time, and that they should go back to their car to drive on. Guess the hadn't taken the ferry before. Our turn to scan tickets, but the machine couldn't read them. We ended up having to go to the kiosk to have them exchanged for tickets from their machines, which thankfully did scan. We boarded just a few minutes before setting sail. The passage to Bainbridge Island is a bit over a half hour, so it wasn't too long before we set foot on the island and began the eastern loop of the Waterfront Trail. That loop was through mostly residential areas, but we did get to a small beach with a great view of the ferry dock. We saw several houses which were on extremely narrow lots, and several other houses which looked like they had been there a while. 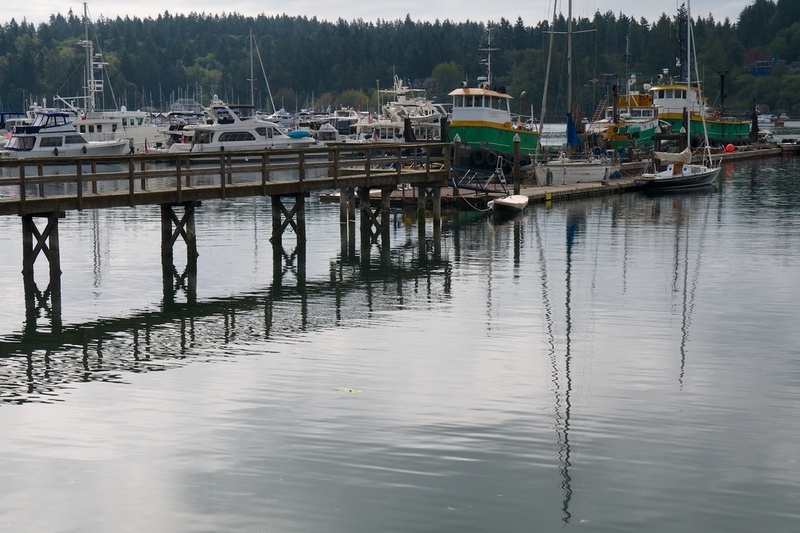 Arriving where we started, we began the western loop, which took us through Eagle Harbor Waterfront Park (where we saw four kids struggling to carry their boat up the launch), Strawberry Cove Park, and more residential areas which felt like mainland suburbs. Throughout our walk, we saw several frog sculptures, figuring they were an island-wide art project. Before too long, we were back downtown (where we saw a map showing locations for the frog sculptures) and were ready for lunch. We settled on going to a small bakery where we split a quiche and a savory tart. We saw that both the north and south loop Frog Hoppers were going to leave soon so we rushed out, trying to find the stop. We saw no busses go by, nor did we see where we were supposed to catch them. We ended up going back to the ferry terminal to ask the guy at the information booth, who told us that the Frog Hopper stopped running the year before. Since getting a cab was the only practical way to get to either Bloedel Reserve or the Japanese-American Exclusion Memorial, we decided to go put off visiting those until we returned on a day other than Sunday, when the busses were running. We stopped by the Bainbridge Island Museum of Art, which hasn't been open for very long. They have a modest yet interesting collection, as well as a small garden on the second floor. The next stop was to get a snack, and we figured we should go to Mora Iced Creamery, which is where you go to get ice cream on the island. After that, we were ready to head back home, so we walked the now-familiar path back to the ferry terminal. As we got into the ferry building, an announcement came saying an ambulance was going to be on the sailing, and as soon as they could get it onto the ferry, they were going to leave, possibly ten minutes early. We proceeded to the line, seeing that there was an ambulance already in the holding area. The ferry arrived and started offloading vehicles and passengers, and once that was done, we started to board. We stopped to watch the vehicles board, and then saw another ambulance show up, which they positioned so it (as well as the other ambulance) would be the first off the ferry on arrival. They did let several other cars on, and we ended up sailing right on time. The weather on the trip to the island was overcast (we couldn't see the top of the Columbia Tower) but had great views on the way back, with lots of big, puffy clouds. We were lucky with the timing of the busses, since we waited less than ten minutes for the bus which takes us a few blocks from the house (it runs once an hour). We arrived at home pretty worn out; just as well we didn't get to other parts of the island!